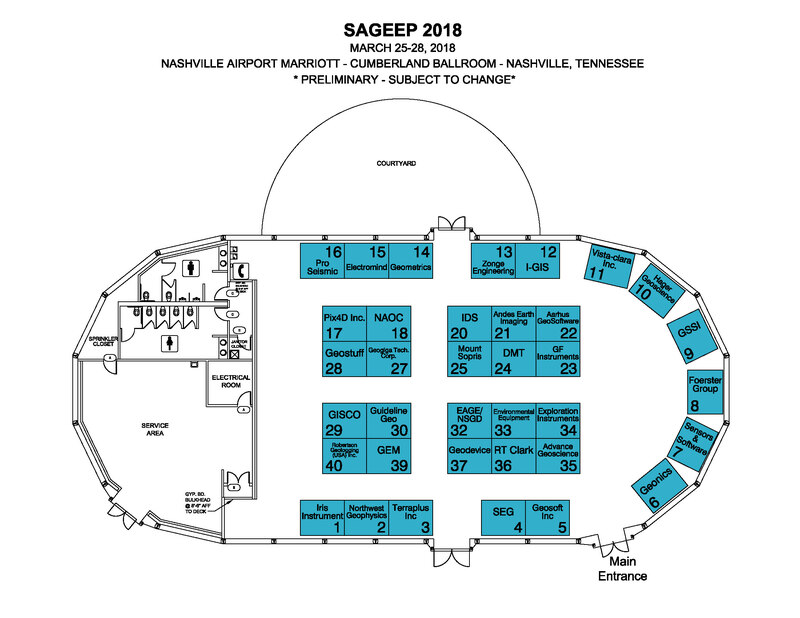 The SAGEEP 2018 Exhibitor Prospectus lists remaining sponsoring opportunities. Please contact the Exhibits Manager (contact information below) with details and questions. Aarhus GeoSoftware is a leading provider of software for processing and inversion of electromagnetic- and electrical data. We have a common platform where data handling is integrated from raw data to processing, inversion, QC of inversion results and visualization of inversion models. Advanced Geosciences, manufacturer of the SuperSting Resistivity/IP/SP imaging system and EarthImager software. Real-time data QC and instrument programming with remote control by App. Guided navigation App with survey planner and GPS processing for towed marine and land deployment (CRP). Projects typically focused on geotechnical, groundwater, mineral, environmental and similar industries. Andes Earth Imaging sells ready-for-deployment systems for DC resistivity and seismic refraction surveying. Our devices have been developed by a superb team of engineers, mathematicians and geophysicists. We strive to make the world's user-friendliest geophysical equipment. Andes Earth Imaging LLC is a subsidiary of Subsuelo3D SAS from Colombia. DMT GmbH & Co. KG: Provider of seismic data acquisition and seismic monitoring systems. SUMMIT X One combines an extremely flexible field layout with excellent data quality and easy handling of the lightweight units in the field. - For further information please refer to www.summit-system.de. EAGE is a professional association for geoscientists and engineers. It is an organization with a worldwide membership, providing a global network of commercial and academic professionals and students. With more than 19,000 members from over 100 countries, the association is truly multi-disciplinary and international in form and pursuits. EAGE operates two divisions: the Oil & Gas Geoscience Division and the Near Surface Geoscience Division. GEM Systems is a manufacturer of advanced magnetometers, gradiometers and magnetic sensors for Earth Science, Geophysics and other applications. With 35+ years in R&D, our technology and leadership is your key to success in applications such as airborne / UAV mapping, mineral exploration, archaeology, earthquake prediction, volcanology, UXO and others. As a leading worldwide software provider, Geogiga is dedicated to producing simple and powerful software packages for Reflection, Refraction, Surface Waves and Borehole Seismic in near-surface geophysics. At SAGEEP 2018, we will highlight the latest release of Geogiga Seismic Pro. Geometrics manufactures, sells, rents, and services magnetometers, seismographs, and electrical conductivity and resistivity systems for land, marine, and air investigations of the subsurface. GSSI is the world leader in the development, manufacture, and sale of GPR equipment. Our cutting edge products are used all over the world to explore the subsurface of the earth. GSSI created the first commercial GPR system 45 years ago and continues to provide the widest range and highest quality systems available today. I•GIS is a specialized geoscience and GIS software and service provider since 2002. Our main product suit is a geodata management system consisting of the modeling software GeoScene3D for geological models and GeoCloud for distributing these together with GIS and geoscience data using cloud-based services. Sale and rental offers are supported with online consulting and immediate instrument service. Through our world leading brands of geophysical equipment, ABEM and MALÅ, we offer best-in-class integrated end-to-end solutions to challenges worldwide. With a truly global footprint we draw on extensive experience since 1923 of innovative, field-tested and trusted solutions including: TEM, GPR, Resistivity, and Seismics. Mount Sopris Instrument Co., Inc.
Mount Sopris has exciting news for SAGEEP 2018 as we release two innovative products. Visit our booth to learn more about the new QL40-SIP (Spectral Induced Polarization) and QL40-nGEN (Neutron Generator), and the amazing 19GR – Nano Gamma tool, the smallest high resolution natural gamma logging sonde in the world! The National Association of Ordnance Contractors (NAOC) is the industry trade association representing businesses performing military munitions response services. Established in 1995 as a non-profit organization, NAOC's objective is to act as a unified voice representing the issues facing our industry. Our membership includes companies that provide UXO services, geophysical services, detection equipment, analytical laboratories, regulatory support and related environmental/engineering services. Serving the Geophysical/Geotechnical industry for OVER 30 YEARS. Sales/Brokerage of NEW and USED/2nd Hand Equipment. Providing Seismographs, Geophones, Cables, Ground Penetrating Radar, Magnetometers, Gravity Meters, EM, IP, Resistivity Meters and MORE. Manufacturer of LAND ENERGY SOURCES – PEG-40 Propelled Energy Generator, Ballard Borehole Source. Distributor of Single Geophones, Connectors, Hydrophones, Cables and More. Sensors & Software manufactures ground penetrating radar (GPR) products. Understanding what lies beneath the surface of materials like soil, pavement and concrete helps solve many problems. Our years of experience, world-leading products and responsive service enable delivery of effective solutions. Terraplus provides rental and sales for a wide range of geophysical instruments and software, including Magnetometers (UAV & Ground Potassium, Overhauser, Proton), VLF, 2D/3D Resistivity/IP Systems, Magnetic Susceptibility and Conductivity Meters for soil investigations, Borehole Systems including Televiewers, Radiometries, GPR, EM Systems, Seismographs, and more. For more information, visit: www.terraplus.ca.